Common Ford Fiesta problems | What Car? Since its introduction in 1976, the Ford Fiesta has spanned six different generations, with successive improvements in safety, economy and design. It has won many awards, too, including our What Car? Car of the Year in 2009, and What Car? Used Car of the Year in 2012. However, while we recommend the Fiesta as the best used supermini, there are problems to look out for. 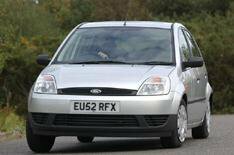 Here we focus on cars built after 2002, when the fifth-generation model was launched. This version came with a 1.3-, 1.4- or 1.6-litre petrol engine, or a 1.4- or 1.6-litre diesel. Three- or five-door versions were available, too, and an automatic gearbox could be specified with the 1.4- or 1.6-litre petrol models. In 2008, an all-new Fiesta was launched. It was built on a new platform, had heavily revised looks and was available in three- or five-door form. Buyers were offered 1.25-, 1.4- and 1.6-litre petrols, and 1.4- or 1.6-litre diesels. Again, the automatic gearbox was reserved for the 1.4 and 1.6 petrol. Some cars built between August 2001 and April 2004 had issues with their airbags. The warning lamp might fail to operate if a fault is identified by the front crash detectors. There have been issues reported with the rear axles of some cars built between August and September 2002. The weld seam that secures the brake unit mounting plate to the rear axle might not be to specification. Some Fiestas built between July 2004 and February 2005 had problems with their fuel pipes. Some cars had pipes that werent made to specification and could degrade, leading to seepage of fuel and a possible fire. A small number of Fiestas built between August and September 2006 have problems with their steering columns. It appears that the columns might not have been handled properly before fitment and could have been damaged as a result. In some cases, this could lead to a loss of steering control. Some cars built between September and November 2007 have power steering issues. Belts that drive the power steering pump could de-laminate and fail. This could lead to the loss of power-assisted steering. Some fifth-generation Fiestas had issues with their water pumps. Listen for grumbles and groans from the engine while it idles. Its an 85 bill, so be on the look out. Check for damp patches in all cars of this generation. Faulty pollen filters can allow water to enter the cabin and its a 50 bill for new filters. There is a possibility that some cars built after 2011 had faulty exhausts. In rare cases, the blanking plug on the exhaust might not maintain the correct tightness, leaving an open hole in the system. The hot gases can melt the engine cooling fan moulding and cause fire and fumes in the cabin. Some cars built during September 2011 had faulty rear suspension. Their rear axle mounting bolts did not meet the required specification and its possible the bolt could break. Fifth-generation Fiestas have been known to have problems with their stereos. People have reported the stereo failing completely, or not connecting to their phones. Most of these problems should have been fixed for free by Ford, but should you come across anything, always bring it to the attention of the seller.